London is all about iconic buildings. From the Houses of Parliament to the skyscrapers of The City Of London architecture is a major player in the identity of this capital city. When it comes to hotels there are few that can boast being themselves one of those iconic buildings of London, that is except for The Savoy Hotel, on The Strand. After nearly five years of building, The Savoy opened on 6th August 1889. Built by Richard D’Oyly Carte on land adjacent to his Savoy Theatre built in 1881, the new Savoy hotel offers accommodation for the many tourists, especially Americans, who have travelled to London to see the Savoy Operas. The main restaurant was opened by noted hotelier Cesar Ritz, who later becomes general manager, and installed his old friend, August Escoffier, “king of chefs and chef of kings”, in the Savoy kitchen. In 1930, the 1904 sculpture of Count Peter of Savoy was winched into his new vantage point on top of the striking new “Savoy” sign that is the latest piece of art deco design to be added to The Savoy. 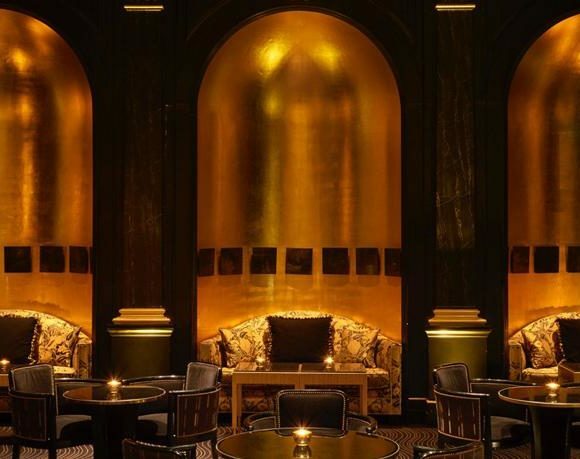 From Kaspar, The Savoy’s lucky black cat sculpture, to the stunning modernist illustrations of The Savoy Cocktail Book, the hotel is filled with elegant new features in the modish art deco style. Sauntering up The Strand you cannot but be overwhelmed by the lavish impressive frontage of The Savoy Hotel, like an Art Deco behemoth amongst the new and old architecture of this part of London, it stands poised, a memory of 1920’s London, welcoming in tourists and business folk alike. Rachel and I made our way to check-in through the brass and wooden rotating doors and across the marble lobby; although our suite was not ready the staff were attentive taking our bags to be placed in our room ready for our return later that afternoon. 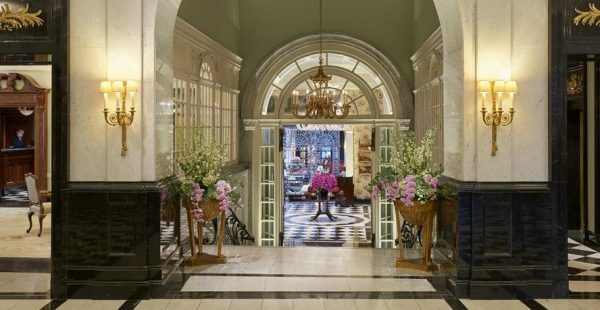 Perfectly placed on the north bank of the River Thames and set within Covent Garden’s vibrant shopping and theatre district The Savoy is the perfect hotel from which to explore London’s West End. Rachel and I made our way to Covent Garden for a spot of lunch and retail therapy before heading back to the hotel. 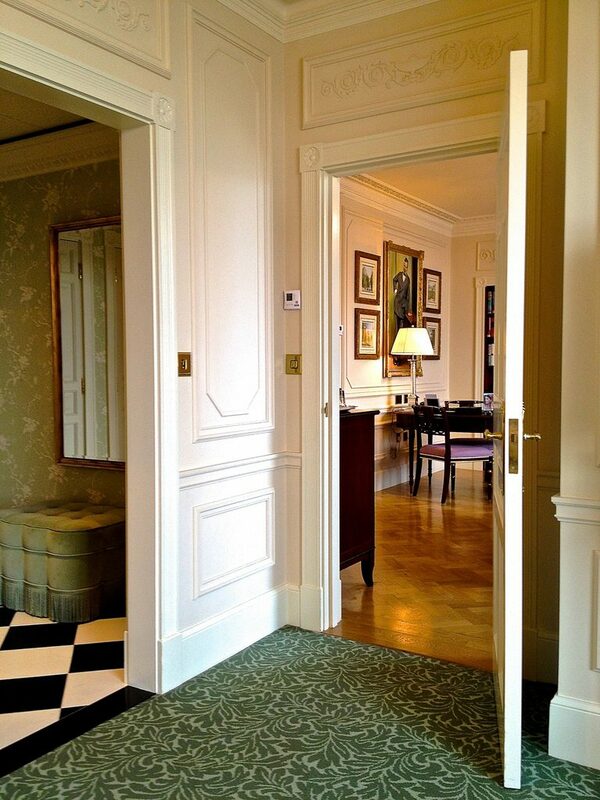 The hotel boasts 268 lavishly appointed rooms and suites and are decorated in either Edwardian or Art Deco styles. 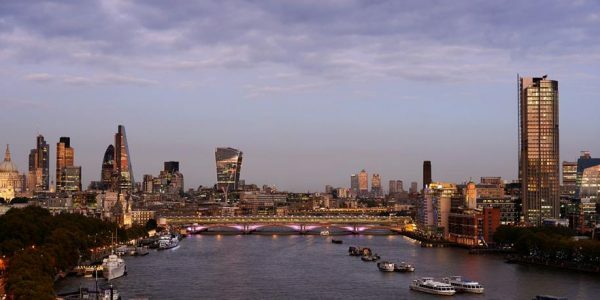 They all feature luxurious marble bathrooms and many rooms afford breathtaking views over the River Thames. We were shown to our gorgeous one bedroom suite with river view. This large, one-bedroom suite offered unrivalled, panoramic views of the River Thames from both the sitting room and the bedroom. 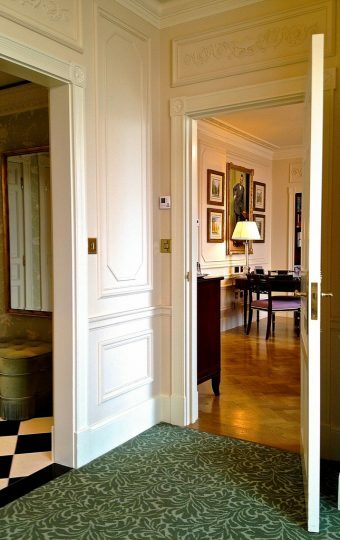 Decorated in elegant Edwardian style, the suite had a separate sitting room, large bedroom with en-suite bathroom, entrance foyer, and guest cloakroom. Retaining much of their original character, no two suites are the same. The spacious, luxurious marble bathrooms all feature a freestanding, claw foot bath, separate walk-in showers with the famous Savoy rain showerhead, a double vanity, large chrome fittings and Le Labo amenities. The one bedroom suites with river view feature a writing desk that converts into a dining table, sofa, two armchairs, personal bar, Loewe 40” flat-screen television, DVD player, iPod docking station and bespoke Savoy furnishings. 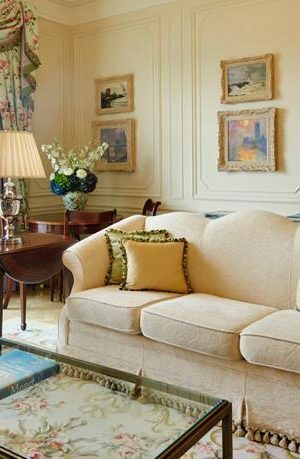 Then if one does not think that is enough the suites also benefit from The Savoy’s dedicated Butler Service, through the Savoy Suite Welcome! Our own butler? What more could one want? Settling into our surroundings we were struck by the views of the Thames from both the bedroom and lounge, you get a real sense of London from these rooms, with the perfect vantage point to see the architecture of the banks of the Thames and beyond. We unpacked our evening wear, for dinner was booked at Kaspar’s, a seafood restaurant and oyster bar designed in dazzling Art Deco style housed in the hotel, and explored the suite further. There were so many wonderful features, from the iPod dock allowing us to play our own music to the stunning walk in shower. We both made full use of the luxurious bathroom prepping ourselves for our evening ahead, primped and preened we made our way back down to the lobby for drinks at the award-winning legendary American Bar before dinner at Kasper’s. Following a marvel of an evening including seafood, champagne, cocktails and live jazz in the gilded elegance of the Beaufort Bar, Rachel and I made our way back to our suite, cocktails still in hand. Like bright young things you cannot but help get into the decadent spirit of the 1920’s in this iconic hotel. From the décor to the food, the cocktails to the live piano music you feel transported to another time, a time of lavish parties, dancing and gaiety, fabulous food and the musicals of Gilbert and Sullivan. Not wanting the party to end we begrudgingly got into bed . . . soft white cotton transported us to the land of nod, dreaming of fox-trotting across the marble floors of the Savoy sipping champagne. After a wonderful nights sleep we awoke to the sun over the River Thames, London was awake and so were we and breakfast was calling! Back in Kasper’s we took a seat and perused the breakfast menu, all the usual offerings are available but as Kasper’s is a fish restaurant they also offer such delights as Cornish crab on English muffin and fried egg and Grilled kippers with herbed lemon butter. I opted for bacon and eggs with gluten free toast while Rachel went for Eggs Florentine, a tried and tested favourite, washed down with lashings of freshly brewed coffee. Stuffed to the brim and all packed it was time to leave one decade and enter back in to another, for the 21st Century awaited beyond the walls of The Savoy. Checking out, as always, was a bittersweet affair but a necessary evil, saying goodbye to the attentive staff of this hotel and the lavish Deco architecture that houses them was tough. 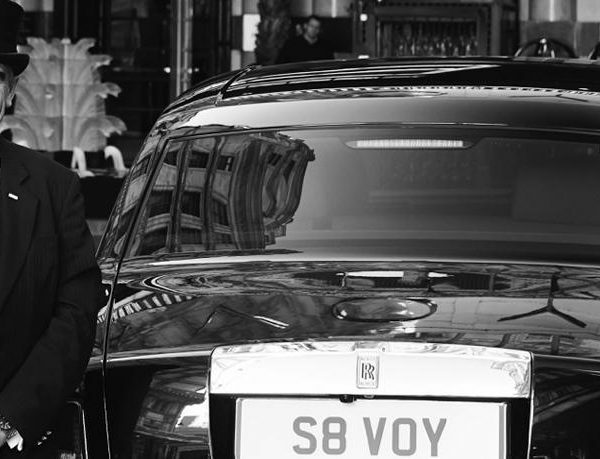 However, the echoing memory of the night before left a smile on our faces as we left through the rotating doors and out to the private driveway of The Savoy, London’s most iconic hotel where British elegance meets Art Deco decadence.